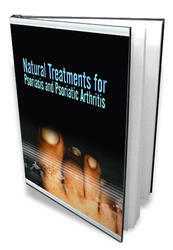 • Rheumatoid arthritis affects women 3:1 over men, with 70% having an insidious onset. • Symmetric synovitis with morning stiffness longer than 1 hour is the hallmark of RA. • Constitutional symptoms are common in patients with RA. Rheumatoid arthritis is a chronic inflammatory systemic disease in which cellular and autoimmune mechanisms result in destruction of tissues, primarily the synovium. Genetic predisposition appears to be important, but a specific inciting infectious agent or other cause has still not been found. RA manifestations vary from very mild, self-limited disease to multiorgan destruction and early death. Increasing knowledge of the modulating factors in disease progression is transforming the treatment of RA. Without treatment, the normally fluctuating disease course results in progressive joint destruction. Patients with active, poly-articular, RF-positive RA have more than a 70% chance of developing joint damage or erosion within 2 years (Fuchs et al., 1989). Because RA is relatively uncommon compared with OA and is now treated quite differently, the family physician must be able to make the correct diagnosis and initiate disease-modifying therapy early, before joint destruction. Rheumatoid arthritis affects women more frequently than men (about 3:1 ratio) and occurs in all age groups but has a peak incidence between 20 and 50 years. Prevalence is 1% to 2% of adults, ranging from 0.3% of the population younger than 35 to about 10% of those older than 65. There is a higher concordance of RA in monozygotic twins than in dizygotic twins because of gender differences and differences in major histocompatibility complex (MHC) class II gene products (HLA-DR). Combinations of different genes most likely predispose patients to the disease. The HLA-DR antigen appears to be triggered by many stimuli. After this inciting event, the synovial lining cells and subsynovial vessels proliferate, forming a pannus. Leukocytes invade, followed by a further inflammatory cascade involving proteases and cytokines. RF produces autoanti-bodies to IgG Fc fragment, influenced by HLA-DR polymorphism and associated with more severe, extra-articular disease. Again, RF is not specific to RA and can be detected in normal persons. 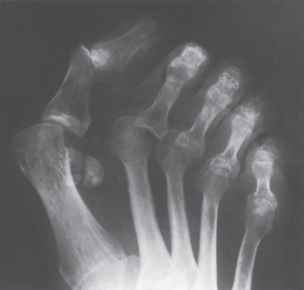 Rheumatoid arthritis is a clinical diagnosis made by careful history and physical examination. Laboratory testing can be confirmatory but is also misleading if not interpreted in context. Radiographic evidence of erosions appears only several months to a year after disease onset. The American College of Rheumatology (ACR) published useful criteria in 1987 for the diagnosis of RA (Table 32-3). Symptoms must be present for at least 6 weeks for initial diagnosis. Symmetric synovitis is the hallmark of RA and can be suggested by joint aspiration of synovial fluid, yielding over 2000 WBCs/mm3 without crystal, or by radiographic evidence of erosions. Because the cause of synovitis cannot be differentiated clinically, extra-articular manifestations can help distinguish RA from other inflammatory conditions. Approximately 70% of patients with RA experience an insidious onset over weeks to months, 10% have an acute abrupt onset, and 20% have an intermediate onset, with increasing symptoms for days to weeks. Morning stiffness occurring for more than 1 hour is suggestive of RA. Morning stiffness results from joint immobilization during sleep and is not related to time of day. As opposed to patients with OA, patients with RA have constitutional symptoms such as fatigue, malaise, weight loss, low-grade fever, and anemia. Small joints in hands and feet (PIP, MCP) are typically involved first, with larger joints involved later. The joints themselves might be warm to the touch but are usually not erythematous. A pan-nus of inflamed synovium palpable as a rubbery mass of tissue strongly suggests RA. The presentation of exacerbations of chronic rheumatoid synovitis might differ from those of early acute synovitis. Chronic inflammation causing fibrosis decreases synovial vascularity, reducing the amount of swelling from previous episodes. Although the frank swelling of burned-out RA appears less severe, the amount of pain, morning stiffness, constitutional symptoms (fatigue, malaise), and joint destruction on radiography shows this physical finding to be misleading. These episodes in patients with chronic, long-term RA should therefore not be considered improvement over more visible, earlier episodes of synovitis. is characterized by brief episodes of swelling of a large joint such as a knee, wrist, or ankle. Palindromic RA can therefore be easily misdiagnosed as gout. Approximately 20% of patients with RA have intermittent symptoms. The remainders have progressive disease of varying severity. from slowly to rapidly progressive. In addition to morning stiffness, synovitis, and structural damage, RA exhibits classic manifestations in specific joints. Cervical spine involvement is common, whereas thoracic and lumbar spine involvement is rare. Early symptoms are neck stiffness and decreased motion, which can lead to neurologic complications from C1-C2 instability resulting from tenosynovitis of the transverse ligament of the first cervical vertebra (C1, which stabilizes odontoid process of C2), as well as disease of the apophyseal joints. Neck pain without neurologic features tends to be self-limited and usually improves, but neck pain and neurologic symptoms often do not correlate well. A neurologic examination, even in the absence of neck pain, is therefore prudent in patients with RA. Radiographs of the cervical spine in flexion and extension might be needed to detect C1-C2 involvement, which necessitates caution during surgical procedures requiring intubation. Shoulder RA usually manifests as decreased ROM. Elbow RA is more accessible than shoulder RA for physical examination and joint aspiration. Elbow involvement can manifest with elbow pain and swelling; ulnar compression syndrome (paresthesia and weakness of fourth and fifth digits) can develop from the synovitis. The wrists are affected in most RA patients, in contrast to OA patients; carpal tunnel syndrome is seen frequently. RA usually involves the MCP and PIP joints rather than the DIP joints. Classic late changes such as swan neck and boutonnière deformities and ulnar deviation of the MCP joints caused by ligamentous laxity might occur. The swan neck deformity is characterized by flexion of the DIP and MCP joints and hyperextension of the PIP joint, probably resulting from shortening of the interosseous muscles and tendons and shortening of the dorsal tendon sheath. The boutonnière deformity results from avulsion of the extensor hood of the PIP because of chronic inflammation. This causes the PIP to pop up in flexion while the DIP stays in hyperextension. Hip involvement in RA might be difficult to detect on physical examination and might manifest as only a small decrease in ROM. If pain develops, it can be felt in the buttock, lower back, groin, thigh, or medial aspect of the knee. RA of the knee is usually easily apparent on examination. A Baker's cyst (posterior herniation of the joint capsule to the popliteal area) might occur and can be diagnosed by ultrasound. Rupture of a Baker's cyst into the posterior leg might mimic thrombophlebitis. RA might involve the MTP, talonavicular, and ankle joints, causing gait problems. The tarsal tunnel containing the posterior tibial nerve can be compressed by synovitis, causing burning paresthesias on the sole of the foot made worse by weight bearing. The synovitis of RA has many effects on cartilage, bone, muscles, tendons, and ligaments. Cartilage and bone erode, and muscles and tendons shorten in response to chronic inflammation. Ligaments are weakened by collagenases released by inflamed synovium and pannus. Upper extremity joints (shoulder, wrist, elbow) are prone to more severe deformities, as previously noted, than knees and ankles because splinting (avoiding joint motion to minimize pain) is easier in these lower extremity joints. The decreased use of these joints leads to more destruction by tendon shortening and contraction of the articular capsule. Morning stiffness in and around the joints lasting at least 1 hour before maximal improvement. At least three joint areas with simultaneous soft tissue swelling or fluid (not bony overgrowth alone) observed by physician. The 14 possible joint areas are right or left PIP, MCP, wrist, elbow, knee, ankle, and MTP joints. At least one joint area swollen as above in a wrist, MCP, or PIP joint. Simultaneous involvement of the same joint areas on both sides of the body; bilateral involvement of PIP, MCP, or MTP joints is acceptable without absolute symmetry. Subcutaneous nodules over bony prominences or extensor surfaces or juxta-articular nodules regions, observed by physician. Demonstration of abnormal amounts of serum rheumatoid factor by any method that has been positive in less than 5% of normal control subjects. 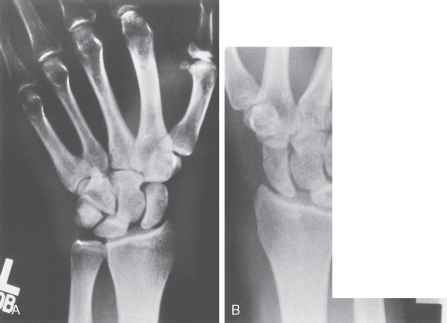 Radiologic changes typical of rheumatoid arthritis on posteroanterior hand and wrist radiographs, which must include erosions or unequivocal bony decalcification localized to, or most marked adjacent to, the involved joints (osteoarthritis changes alone do not qualify). From Arnett FC. Revised criteria for the classification of rheumatoid arthritis. Bull Rheum Dis 1989;38:1. Used with permission. *Four or more criteria are needed for the diagnosis of rheumatoid arthritis (RA). Criteria 1 through 4 must be present for 6 weeks or longer. Presence of criteria is not conclusive evidence for the diagnosis of RA. Absence of criteria is not conclusively negative. MCP, Metacarpophalangeal; MTP, metatarsophalangeal; PIP, proximal interphalan-geal. Systemic constitutional symptoms such as fatigue, malaise, anorexia, weight loss, and fever occur in addition to joint inflammation and destruction in RA. Significant inflammation of almost all organ systems occurs. Patients have an increased incidence of renal, cardiac, pulmonary, and neurologic disorders, serious infections, and hematologic malignancies such as non-Hodgkin's lymphoma. Subcutaneous rheumatoid nodules occur frequently in RA patients, usually in areas subject to pressure such as the elbows and sacrum. Their onset can be abrupt or gradual, and they might also resolve spontaneously. Biopsies are sometimes required to differentiate these from a gouty tophus or xanthoma. Rheumatoid nodules can also occur throughout the body, including (rarely) organs such as the lungs and heart. Pulmonary involvement can include pleural effusions, interstitial fibrosis, solitary or multiple nodular lung disease, and pleurisy. Asymptomatic pericarditis diagnosed by echocardiography during RA exacerbations is relatively common but rarely results in cardiac-related sequelae. Nodules can occur rarely in the myocardium, heart valves, and aorta. Renal and GI complications are generally secondary to the treatment of RA rather than arising from the disease itself. Eye dryness from keratoconjunctivitis sicca, episcleritis, or scleritis is associated with RA. Hematologic complications of RA include a hypochromic microcytic anemia with a low serum ferritin level and low or normal iron-binding capacity. Because many RA patients are taking NSAIDs, it can be difficult to distinguish anemia associated with their RA from NSAID-induced GI blood loss. Felty's syndrome (RA, splenomegaly, leukopenia, leg ulcers, lymphadenopathy, thrombocytopenia, HLA-DR4 haplotype) is most common in patients with severe, nodule-forming RA. Arthritis panels should not be routinely performed and might only confuse the diagnosis. RF, ESR, uric acid level, ANA, and radiographic abnormalities all increase with age in the general population, even in the absence of disease. Therefore, laboratory studies should be reviewed as confirmatory of the clinical diagnosis made by careful history and physical examination. Rheumatoid factor, ANA, and ESR are normally the most helpful tests to diagnose RA. RF is present in 80% to 90% of patients with RA. Therefore, 10% to 20% of patients with RA never have a positive RF. Also, up to 4% of normal young persons have low levels of RF. Moreover, RF titers are not helpful in following disease progression; when a patient is discovered to have a positive RF, repeating the test is of no value. Repeating an RF 6 to 12 months later for patients with initially negative RF may be useful when RA is still being strongly considered. RF can be increased in other diseases, mainly chronic infections (Lyme disease, subacute bacterial endocarditis, tuberculosis, syphilis), viral infections (infectious mononucleosis, cytomegalovirus, influenza), parasitic infections, and other chronic inflammatory diseases such as sarcoidosis, pulmonary interstitial disease, and noninfec-tious hepatitis. Anti-cyclic citrullinated peptide (anti-CCP) antibody is another laboratory test useful in the diagnosis of RA when the diagnosis is in question or the RF is negative. Anti-CCP is more specific than rheumatoid factor for RA with 95% specificity and 69% sensitivity. Positive anti-CCP serology has also been linked with more severe radiologic progression of joint erosions from RA (Nishimura at el., 2007). Anti-CCP can also be positive in patients with active tuberculosis or other autoimmune diseases. Other serum tests include ANA titers, complement, ESR, and CBC. Abnormal ANA titers indicate SLE, Sjogren's syndrome, and scleroderma, but up to 30% of RA patients also have abnormal ANAs. Complements (CH50, C3, and C4) are decreased in SLE but are normal or increased in RA. The ESR, a nonspecific marker of inflammation, might help differentiate RA from other noninflammatory diseases. C-reactive protein (CRP), an acute-phase reactant, is also nonspecific but increases more rapidly than the ESR in early inflammation. A CBC showing a mild normochromic, normocytic anemia and a normal WBC count suggests RA. Thrombocyto-sis might also mimic disease activity as another acute-phase reactant, and eosinophilia might be seen. Synovial fluid analysis in RA shows a yellow-white, turbid, but sterile fluid without crystals. WBC counts of synovial fluid in RA are typically 10,000 to 20,000 cells/mm3 but are at least higher than 2000/mm3, with more than 75% PMNs. Synovial CH50 is lower than serum levels, and the serum and synovial glucose difference is usually higher than 30 mg/dL. Radiography is indicated early when infection or fracture must be ruled out, the patient has a history of malignancy, the physical examination fails to localize the source of pain, or pain persists despite conservative treatment. Early RA might show only soft tissue swelling. Advanced destruction on radiographs should not be required to initiate disease-modifying therapy if a diagnosis of RA is strongly suspected clinically. 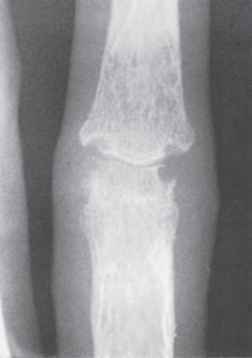 In late-stage disease, radiographs might show marginal bony erosions, periarticular osteoporosis, and joint space narrowing, especially in the hands and feet (Figs.32-8 and 32-9). Almost 90% of joints ultimately affected in a given patient are involved during the first year of the disease, allowing the family physician to alert the patient with chronic RA about which joints will ultimately be affected (Anderson, 2004). Rate of spontaneous remission is extremely low, usually occurring within 2 years of disease onset. The presence of RF, nodules, extra-articular manifestations, and HLA-DR4 haplotype is associated with a more severe course. Mortality rates for patients with severe RA are higher secondary to infections; cardiovascular, pulmonary, and renal disease; GI bleeding; and excess malignancy. The strongest predictors of survival appear to be extra-articular manifestations of the disease and comorbidities (Gabriel et al., 2003). education, physical and occupational therapy, and surgery is optimal. The family physician's role in early diagnosis of RA and subsequent initiation of DMARDs gives patients the best chance for minimizing joint destruction. The early aggressive treatment of RA begins with initial sign and symptom onset through the first 1 to 2 years of the disease. Considering symptomatology such as the patient's overall function, fatigue, inflammation and erosion of joints, and extra-articular symptoms can lead to an early diagnosis. Although long used as the mainstay of pharmacologic therapy, NSAIDs provide only symptomatic relief without improving prognosis. Therefore, almost all patients should start taking a DMARD as soon as the diagnosis of RA has been made (Fig. 32-10). Many DMARDs are no more toxic than high-dose NSAIDs. Treatment options include DMARDs (hydroxychloroquine, sulfasalazine, and methotrexate) and minocycline. After 1 to 2 years of this therapy, the disease will have progressed to established RA. For moderate signs and symptoms, single and combination therapy is applicable, with options such as methotrexate, anti-TNF (tumor necrosis factor), anti-K-1, leflunomide, azathioprine, gold, cyclospo-rine, and other medications for mild RA (Osiri et al., 2003; Wells et al., 2004). The disease progresses to severe rheumatoid arthritis if the treatment options for established rheumatoid arthritis have failed. Therapy such as cyclophosphamide (Cytoxan), a different DMARD selection, pulse steroids, and Prosorba Column (protein A) could then be considered. Along with prescribing the DMARD, the family physician must educate the patient and family about the importance of DMARD compliance. Physical and occupational therapy are important for joint protection during exacerbations, as is exercise to improve function and ROM. Early consultation with a rheumatologist is generally recommended. Although traditional first-line therapy has included aspirin and NSAIDs, DMARDs are now used more frequently in early RA (Table 32-4). Because of the potential for toxic-ity, it is important to differentiate RA from other causes of synovitis as well as from OA. The 2008 ACR recommendations identified four adverse prognostic factors that would encourage use of DMARDs: functional limitation, extra-articular disease, RF positivity or presence of anti-CCP antibodies, and bony erosions documented on radiographs. Hydroxychloroquine appears to be the least toxic of the DMARDs, followed (in order) by sulfasalazine (Azulfidine), methotrexate (Rheumatrex), intramuscular (IM) gold sodium thiomalate (Myochrysine), and aurothioglucose (Solganal). Hydroxychloroquine is dosed at 200 mg orally once or twice daily; however, patients need ophthalmo-logic follow-up in 6 months (Carmichael et al., 2002; Wassenberg and Rau, 2003). Hydroxychloroquine is generally only used for patients with milder RA symptoms. Significant improvement was seen in patients with mild RA taking hydroxychloroquine compared with those taking placebo (Davis et al., 1991). 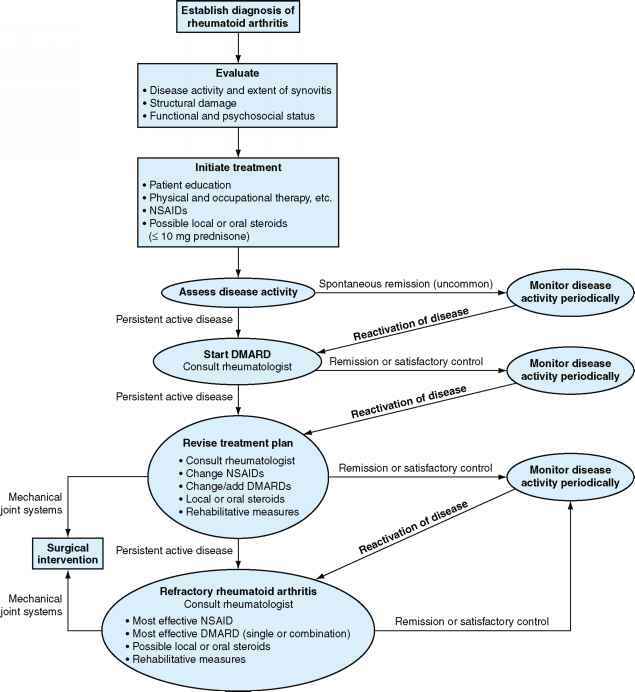 Figure 32-10 Algorithm for management of rheumatoid arthritis. DMARD, Disease-modifying antirheumatic drug; NSAID, nonsteroidal anti-inflammatory drug. pain control with analgesics should be given and the patient counseled about realistic expectations. IM: 10 mg followed by 25 mg 1wk later, then 25-50 mg weekly until there is toxicity, major clinical improvement, or cumulative dose of 1 g. If effective, interval between doses is increased. Nephrotoxicity, tremor, hirsutism, hypertension, gum hyperplasia. *Use only in patients whose disease is refractory to disease-modifying antirheumatic drugs (DMARDs). ACE, Angiotensin-converting enzyme; ALT, alanine transaminase; bid, twice daily; CBC, complete blood count; CNS, central nervous system; DTRs, deep tendon reflexes; GI, gastrointestinal; hCG, human chorionic gonadotropin; IM, intramuscular; IV, intravenously; LFTs, liver function tests; PPD, purified protein derivative; qd, once daily; SC, subcutaneously; TB, tuberculosis; tid, three times daily; U/A, urinalysis; WBC, white blood cell count. (treated with colchicine), opportunistic infections, and hypersensitivity pneumonitis (treated with corticosteroids). It can be difficult to withdraw methotrexate once it has been started without causing a disease flare. Azathioprine (Imuran) is used for moderate and severe RA as a second- or third-line drug after methotrexate, sulfasala-zine, gold, and hydroxychloroquine have been tried. It suppresses bone marrow and can lead to infection. After the initial DMARD therapy, azathioprine can be tried in a 2- to 6-week course. No evidence has demonstrated increased effectiveness over other DMARDs (Suarez-Almazor et al., 2000d). Cyclosporine (Sandimmune, Neoral) is used in combination with methotrexate and is given as a 2.5-mg/kg dose to prevent hypertension and renal disease. It has shown modest efficacy in short-term treatment with progressive RA (Wells et al., 2000). D-Penicillamine (Depen, Cuprimine) has unpredictable toxicity, making it a less attractive choice. The alkyl-ating agents cyclophosphamide and chlorambucil, as well as cyclosporine, are effective but are reserved for refractory severe cases because of their toxicities. All second-line drugs are teratogenic, so a family physician must help the patient establish an effective means of birth control. The risk of toxic effects is an important factor in choice of these agents, and selection is generally best handled in consultation with the rheumatologist. Leflunomide (Arava) inhibits pyrimidine synthesis, is given orally, and is considered a possible alternative to methotrex-ate for decreasing erosion and controlling inflammation, but it provides no apparent benefit over methotrexate and is expensive. Leflunomide has been shown not only to reduce symptoms but also to slow disease progression. The routine dosage is 100 mg daily for 3 days, followed by a maintenance dosage of 10 to 20 mg/day. LFTs must be ordered, and as with methotrexate, levuflunomide is better for short-term therapy (Suarez-Almazor et al., 2000a). Research continues into combining DMARDs to lower drug resistance. DMARD combination therapy in early RA has shown minimal benefit (Mottonen et al., 1999). Cytokines such as interleukin-1, tumor necrosis factor alpha (TNF-a), granulocyte-macrophage colony-stimulating factor, interleukin-6, and chemoattractant cytokines (known as chemokines) are derived from macrophages and fibroblasts and appear to be the most important cytokines involved in RA treatment. TNF-a is produced by synovial macrophages and causes many destructive inflammatory actions in the rheumatoid joint. Synovial macrophages proliferate; syn-oviocytes (fibroblast-like cells lining the joint) produce prostaglandins and cytokines, continuing the inflammatory process. Administering monoclonal antibodies such as inf-liximab (Remicade) to bind TNF-a and block its activity and giving TNF-a receptors such as etanercept (Enbrel) are two approaches to decrease TNF activity. Patients with a suboptimal response to methotrexate at 25 mg/wk (maximum dose) are the best candidates for etanercept or infliximab. Before starting any anticytokine therapy, CBC and tuberculin test (PPD) are required. Etanercept, a recombinant p75 TNF-a receptor-Fc fusion protein, is given subcutaneously once to twice weekly. It decreases binding of TNF-a to cellular receptors and avoids downstream inflammation. It is well tolerated and is indicated for use alone or with methotrexate for methotrexate-refractory disease (Blumenauer et al., 2003; Weinblatt, 1999). The most common side effect is injection site erythema, which must be carefully watched in RA patients with diabetes mellitus. Etanercept has significantly reduced disease activity in a dose-related manner over 6 months, with no laboratory abnormalities noted (Moreland et al., 1999). Infliximab, an anti-TNF-a monoclonal antibody, is given intravenously for refractory disease every 4 to 8 weeks. It is 75% human and 25% mouse antibody to TNF-a. The primary mechanism is halting joint space narrowing, with subsequent decreased erosion. It is FDA approved only in combination with methotrexate. Again, caution is warranted in diabetic patients for skin ulcers. If the patient has a positive PPD, isoniazid and vitamin B6 therapy must be given for 9 months with the treatment. Fewer appropriate trials exist for infliximab than etanercept; however, the benefit in refractory disease has been demonstrated (Blumenauer et al., 2004). Adalimumab (Humira), 40 mg subcutaneously every other week, has a greater therapeutic potential when used with methotrexate (OnMedica, 2005). It is a full human anti-TNF-a. Fewer studies exist on its long-term efficacy, but short-term studies show a greater effect than infliximab or etanercept. Risk factors with this regimen include skin infection, malignancy, and demyelination. The NSAIDs improve inflammation and pain but do not alter disease progression. Therefore, most patients with RA should be taking a DMARD. NSAIDs are used for analgesia and to help control symptoms. DMARDs generally have a slow onset of action, necessitating use of other agents to help keep the patient comfortable while awaiting onset of the DMARD's action. NSAID-associated GI bleeding is a widespread problem; one in three RA patients will be hospitalized or will die from a GI bleed at some point. Selection of NSAID is largely empiric (Table 32-5). The least toxic NSAIDs are coated or buffered aspirin, salsalate (Disalcid, Mono-Gesic, Salflex), and ibuprofen (Advil, Motrin, Nuprin, Rufen). The most toxic are indomethacin (Indocin), tolmetin sodium (Tolec-tin), meclofenamate sodium (Meclomen), and ketoprofen (Orudis, Oruvail). High-toxicity NSAIDs provide no more clinical benefit than lower-toxicity drugs (Fries et al., 1991). Misoprostol (Cytotec), a synthetic prostaglandin analogue, helps decrease NSAID-induced risk of gastric and duodenal ulceration. Although 30% to 40% of patients receiving 200 mg of misoprostol four times daily experienced diarrhea, lower doses (100 mg two or three times daily) cause less diarrhea, with most GI protection maintained. PPIs such as omeprazole used with the NSAID are better tolerated than misoprostol and are also efficacious. As mentioned, sucral-fate and normal doses of H2 blockers might help dyspepsia but have not prevented ulcer formation from NSAIDs such as PPIs and misoprostol. Patients receiving long-term nonselec-tive NSAIDs should be monitored several times annually for hematocrit abnormalities and should undergo stool guaiac testing and have renal and liver function evaluated. There is no benefit to combining different NSAIDs. High-dose aspirin (900-1050 mg four times daily) is as effective as much more expensive NSAIDs but is often less well tolerated and less convenient to take. Glucocorticoid articular injections are often used for temporary localized suppression of RA but are not recommended for use more than three times per joint per year. Common drugs for injection (used with lidocaine to minimize patient discomfort) include hydrocortisone, triamcinolone (Kena-log, Aristocort), methylprednisolone (Depo-Medrol), dexa-methasone (Decadron-LA), and betamethasone (Celestone Soluspan), in ascending order of duration of action. Systemic corticosteroids are used primarily as bridge therapy for several months when initiating DMARDs and awaiting their onset. Prednisone might be especially useful for constitutional symptoms such as fatigue and malaise. Low-dose prednisone (<7.5 mg daily) in a single morning dose might particularly be useful in older adult patients when other drugs have more potential for toxicity. Surgery is useful in RA patients with more severe disease who, despite optimal medical treatment, develop joint erosions and severe destruction resulting in pain and limitation of function. Surgical procedures range from carpal tunnel release to synovectomy, joint fusion, and arthroplasty. About 90% of older adult patients with severe incapacitating rheumatoid joint disease can expect excellent pain relief and increased ROM after total hip or knee replacement (Harris and Sledge, 1990). On the basis of the theory that persistent mycoplasma infection might cause RA, tetracyclines such as minocycline (Minocin) have been used by some physicians for years. Minocycline, 100 mg orally twice daily, has shown modest efficacy but can lead to dizziness and dosing sensitivity in early RA (O'Dell et al., 2001). A small study showed that use of minocycline (100 mg twice daily) in early RA (first 3 months after diagnosis) resulted in more frequent remissions, and the need for DMARD therapy was reduced after follow-up for 4 years (O'Dell et al., 1999). These antibiotics result in mild improvement in RA patients, and other actions may include inhibition of collagenase activity, direct anti-inflammatory effect, and interference with leukocyte function. NSAID, Nonsteroidal anti-inflammatory drug; qd, once daily; bid, twice daily; tid, three times daily; qid; four times daily. joints where a protein analogous to the orally dosed antigen resides, resulting in immune tolerance and reduced inflammation (Kalden and Sieper, 1998). Nutritional changes are hypothesized to decrease RA signs and symptoms. A Cochrane review of herbs found that gamma-linolenic acid (GLA) resulted in some improvement in clinical outcomes (Little and Parsons, 2000; Zurier et al., 1996), consistent with other findings on essential fatty acids. Fish oil, high in omega-3 fatty acids, significantly improved the number of tender joints and morning stiffness (Fortin et al., 1995; Volker et al., 2000); the recommended dose would be 3 g/day, and symptom relief might not be evident until 12 weeks of use. Changes in the total diet have been studied as well. Fasting has anecdotal evidence for inducing remission of symptoms. A 7- to 10-day fast followed by a gluten-free vegan diet was found to sustain improvements (Kjeldsen-Kragh et al., 1991; McDougall et al., 2002). Proceeding immediately to a vegan gluten-free diet resulted in RA symptom improvement (Hafstrom et al., 2001). Symptoms were exacerbated with challenges of foods that patients had reacted to on skin-prick test (Karatay et al., 2004). Therefore, a trial of such a diet or an elimination diet would be reasonable options (Box 32-2). Because RA is a chronic disease with significant psychosocial impact, the continuity that the family physician provides is crucial. Frequency of visits depends on disease activity, need for drug toxicity monitoring, and psychosocial functioning of the patient (see eTable 32-4 online). Periodic ESR/CRP levels, radiography, and functional status assessment are important, in addition to serial joint examination. A team approach using the expertise of a rheumatologist and physical and occupational therapists is generally indicated. Patients' ability to perform their job must be considered, and using modified work profiles or absences may be necessary. Osteoporosis resulting from RA should be monitored and prevented. The patient should also be monitored for infection, pulmonary disease, renal disease, or GI bleeding, taking a general health maintenance approach to this systemic disease. The NSAIDS are the preferred treatment for pain in rheumatoid arthritis (SOR: C). Treatment of RA with DMARDs should be started as soon as possible (SOR: C). Methotrexate has substantial benefit in the treatment of RA and is generally the first-line DMARD (Suarez-Almazor et al., 2000a) (SOR: A). Sulfasalazine has proven benefits on RA disease activity (Weinblatt et al., 1999) (SOR: A). However, it should be used as sole therapy only in patients with minor symptoms and no poor prognostic signs of RA. Hydroxychloroquine has been shown to be effective in treatment of RA (Davis et al., 1991) (SOR: B). However, it is generally used with another DMARD or methotrexate in refractory cases when initial treatment fails. Biologic agents such as etanercept and infliximab reduce RA disease activity and are important treatment options in patients with moderate to severe RA who have failed treatment with methotrexate or combination therapy (Blumenauer et al., 2003; Weinblatt, 1999) (SOR: A). 1. Decide which foods might be causing problems. This step involves describing your diet for your doctor and sharing your ideas about what foods might be causing problems. Sometimes, food allergy tests are used to help with the decision. 2. Avoid the foods completely for 2 to 4 weeks. This is the actual elimination step. This step involves the greatest restrictions in your diet. • The foods need to be avoided completely for symptoms to be noticeable when the foods are added back. • Foods should be avoided both in their whole form and as ingredients in food. • Keeping track of how you feel during this step is important. It is useful to keep a written record. You may feel worse before you feel better, but that should last only 1 or 2 days. If you feel worse for longer, please call your doctor. 3. Add the foods back one at a time. This is called the challenge step. It allows you to learn which foods, if any, are causing symptoms. • Decide with your doctor which food to add back first. • Keep track of how you feel throughout this step with a written record. • On the day a food is added, eat that food twice. For the next 2 days, do not eat that food again, but continue to follow the elimination diet. You can have a reaction up to 3 days after a food is eaten. • Add a new food every 3 days, because you can have a reaction up to 3 days after the challenge food is eaten. • If the food does not cause a reaction, that food "passes" and can be added back to your diet when the entire process is over. Do not eat the foods you have added back, even if they "passed," until you have tested all the foods. • After following the elimination diet carefully, you and your doctor will have a better picture of which foods, if any, are causing your problems. Remember that problems with foods can be intermittent, and it is sometimes difficult to tell exactly whether foods are a problem. From Rakel D: Integrative Medicine. Philadelphia, Saunders, 2002.